I PM'd Fred because I noticed that there wasn't a sticky on how to repot orchids that could be linked to new people. He said it was a great idea and I offered to write one up. 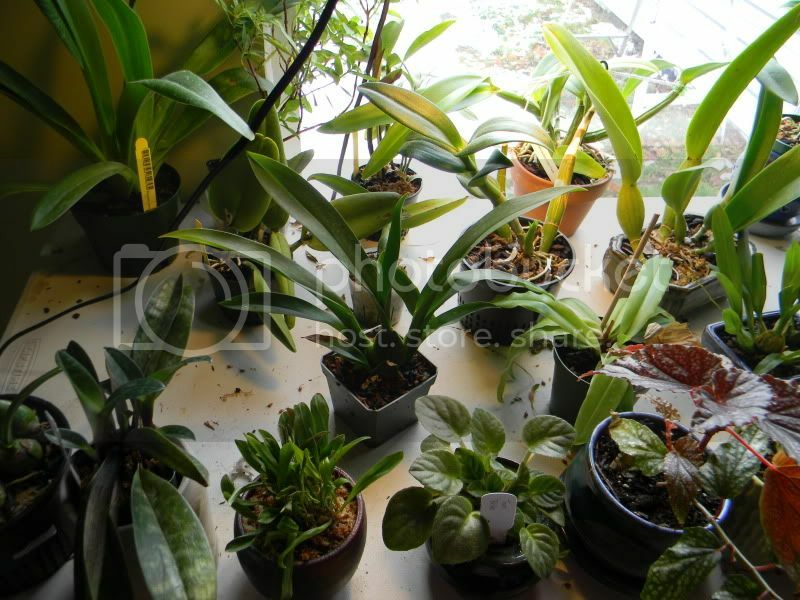 Unfortunately at the time, I didn't have any orchids that needed to be repotted! Today I finally did, so I went ahead and took pictures of my repotting process. Step 1) Soak your new potting medium at least an hour, over night is best though. Choose a mix that makes sense to your climate. I live in a very dry area, so I mix in some sphagnum moss to my bark chips and charcoal. If you live in a very humid, warm area, you might choose just bark and charcoal, or an inorganic media such as lava rocks. (I don't think inorganic media needs to be soaked, just rinsed off to make sure it's clean). New, dry orchid bark actually seems to repel water. Soaking it makes it a little more absorbent. 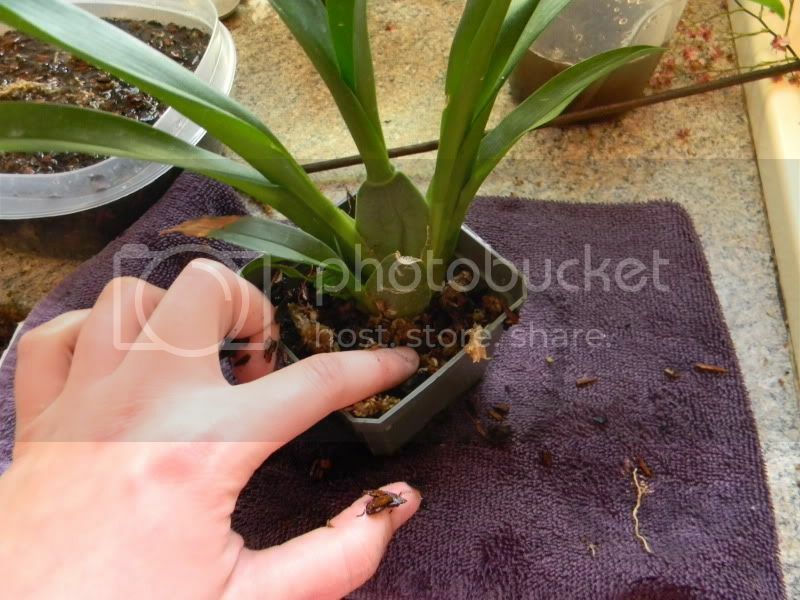 Step 2) Unpot your orchid. Step 3) Remove the old media. Gently pick the old media off the roots. Remove as much as you can while being careful not to damage any roots. 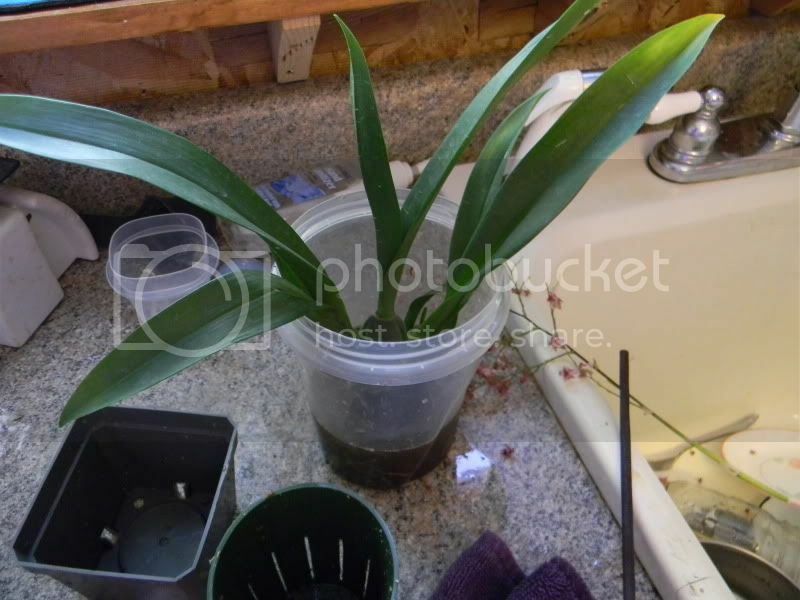 This oncidium had been potted in regular potting soil with sphag wrapped around it and shoved in a pot, so I had to rinse the roots off with water to get the potting soil off. Step 4) Inspect roots for health. 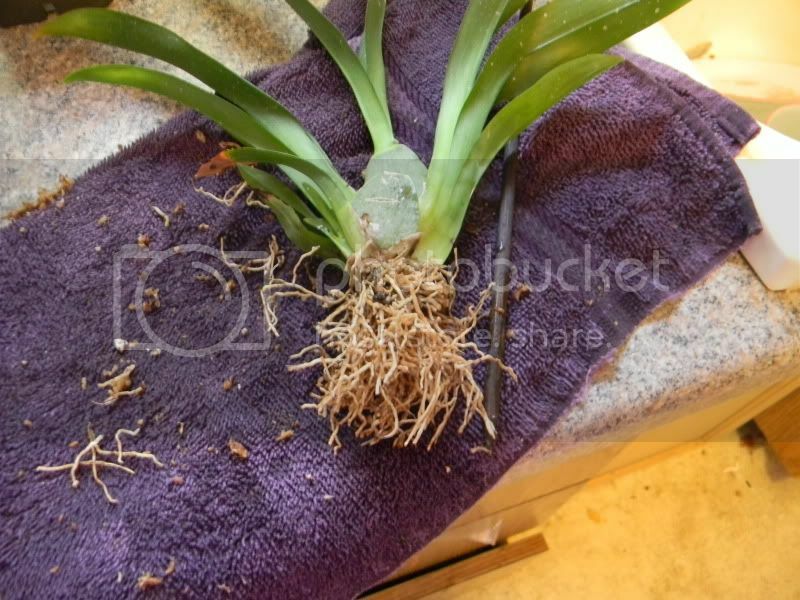 While the orchid is bare-root, take the time to inspect the roots and how healthy they are. Healthy roots are firm and can range in color from green or yellow when wet, to white when dry. Some species of orchid even have brown roots. So long as they are firm when you gently squeeze them, they are still good. Sterilize a pair of scissors in a candle flame and use them to clip off any roots that are mushy and soft, or hollow and papery dry. 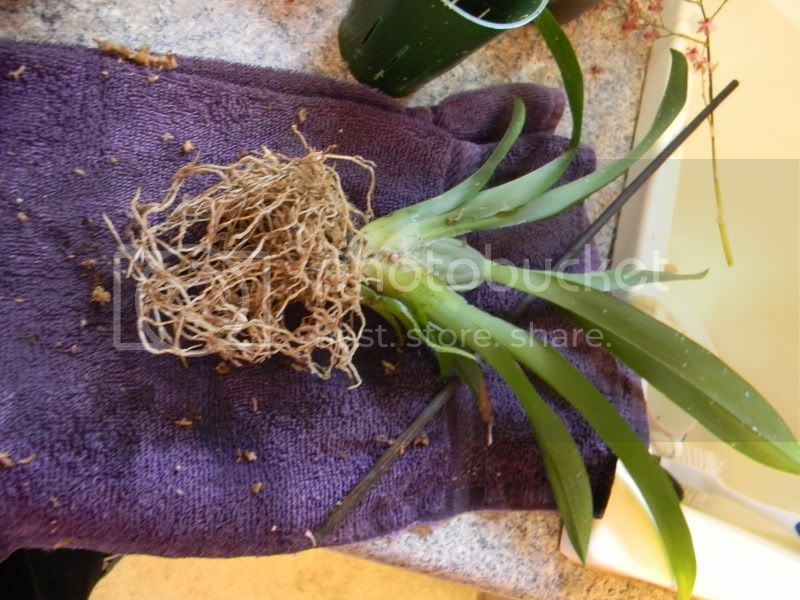 This oncidium had lots of roots, but because they are so fine, it's hard to tell which are good and which are bad, so I trimmed them all down uniformly, but left enough of them to anchor the plant in the pot. It won't kill the plant to cut off healthy roots, it will just encourage it to grow more to replace them. With orchids like phalaenopsis with much thicker roots, it's much easier to tell which ones are still good and which are rotting. Step 5) Choose the right pot. It might seem like you should pick a pot for your plant before you begin, and it is nice to have a collection of them on hand to pick from. 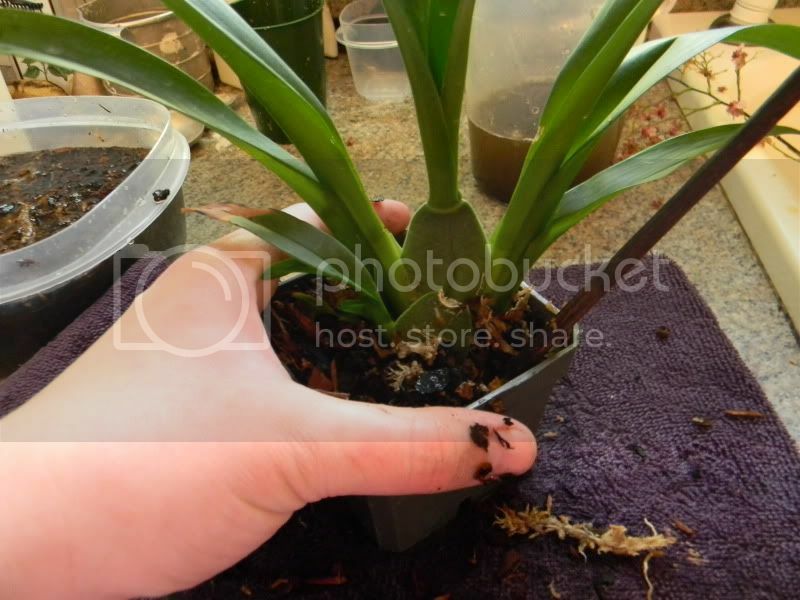 But until you pull the plant out of the old pot and inspect it's roots and trim off the rotten ones, it's very hard to determine how big the pot should be. 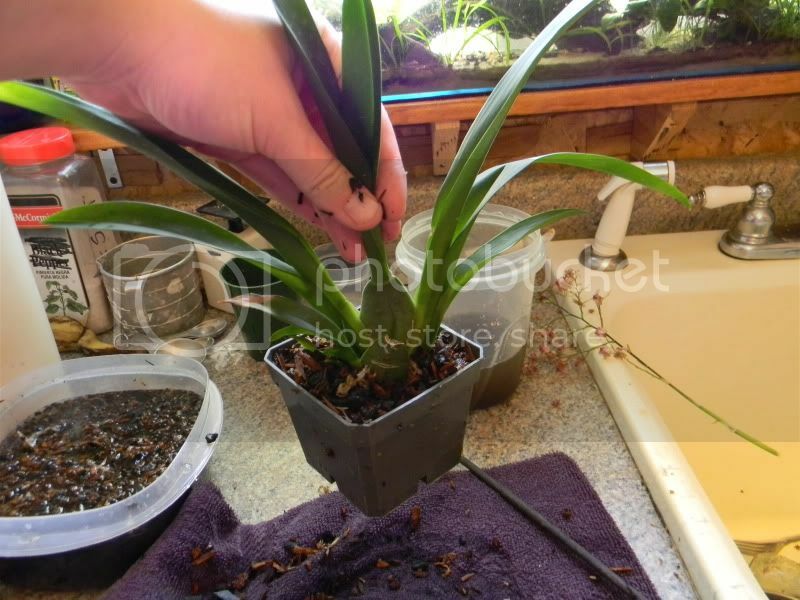 Ideally, the pot should just be one size larger to allow for new growth of both roots and pseudo bulbs/canes depending on the species. However, if you had to remove a lot of rotten roots, you may end up putting the plant back in the same pot, or even a smaller one than you started with. 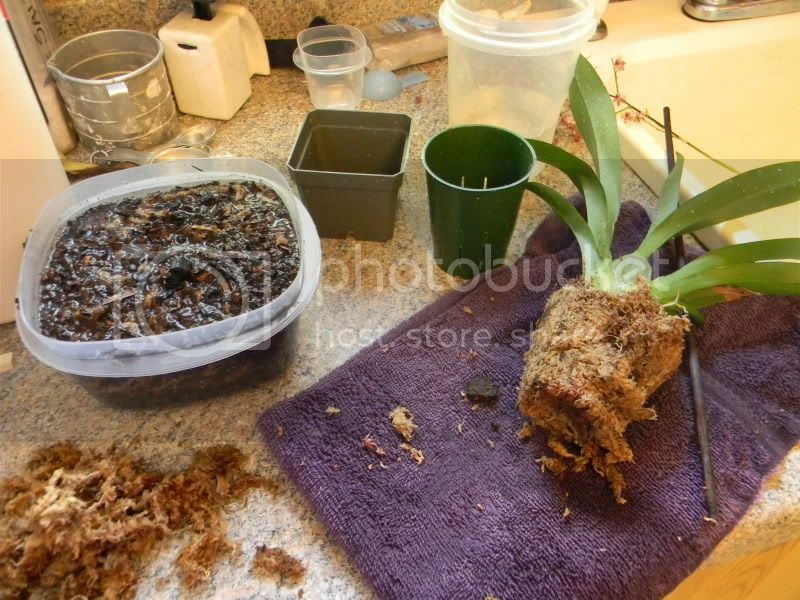 Make sure you sterilize the pot before potting up a new orchid. I soak my pot in 1 part bleach to 19 parts water solution for about 10-30 minutes. 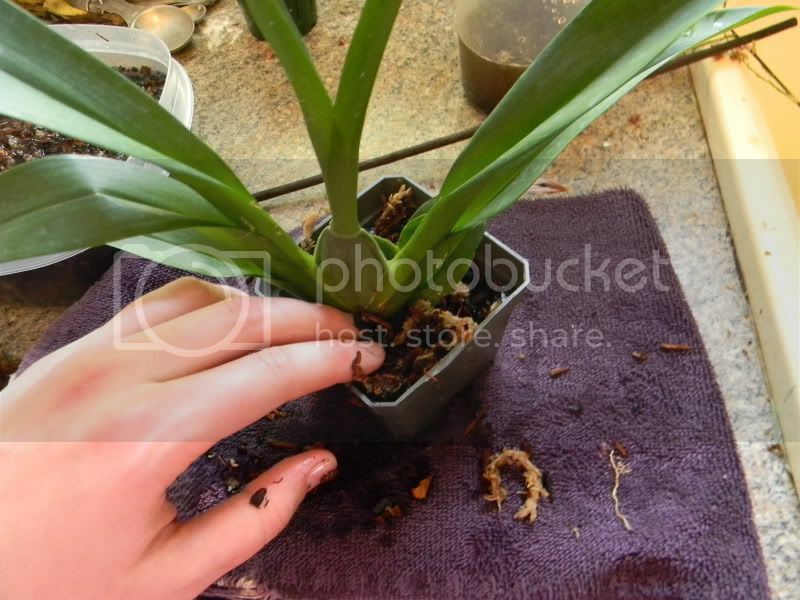 This is especially important if the pot is being re-used and used to hold another plant. Choose a pot that doesn't leave a lot of extra room around the root ball. There should be some room for growth and expansion, but not too huge. 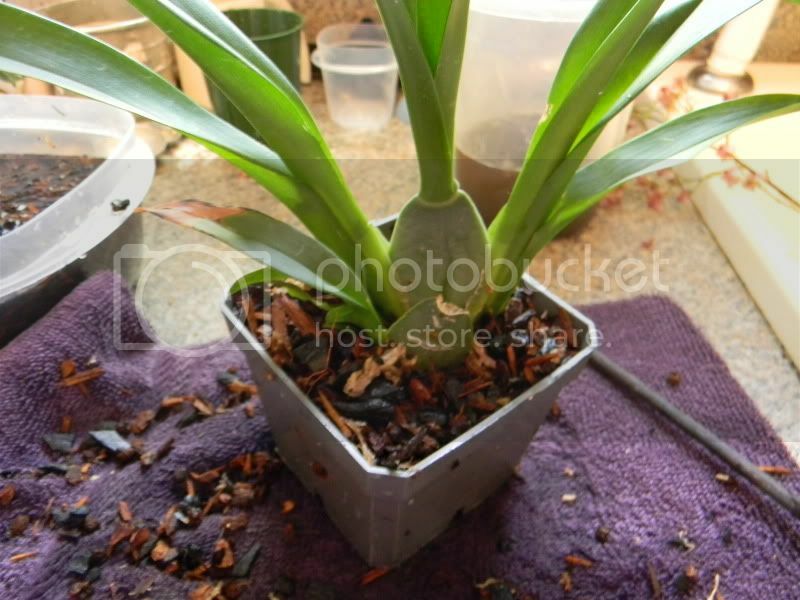 For this Oncidium, I chose a pot that is wide and shallower than it's old pot. 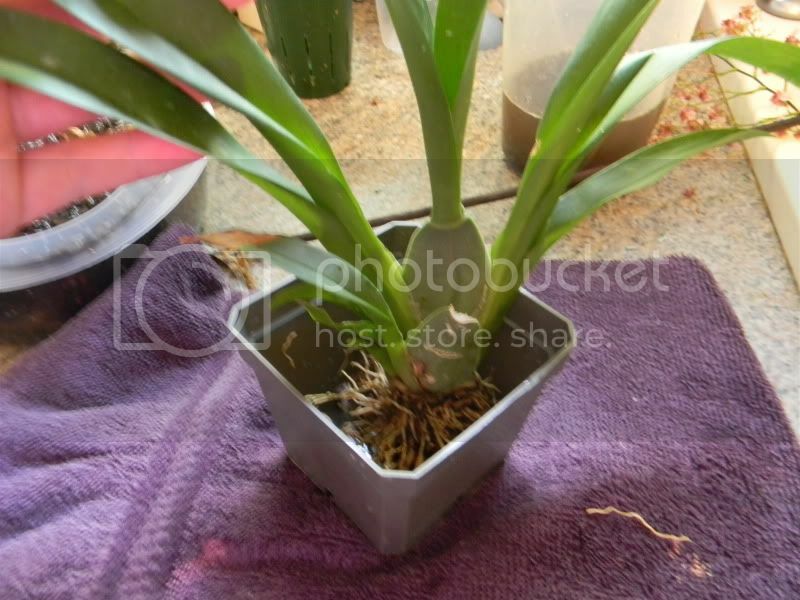 This is because this particular type of Oncidium (it's a twinkles) have shallow root systems, so this shape pot will allow it room to grow and better accommodate it's shallower root system. Step 6) Start filling in your pot. With the plant in the pot, start filling in the potting media a little at a time, taking care to push the media into and between the roots. I like to use a bamboo chopstick or a flower stake to push the bark into the pot and make sure there are no gaps or hollows. To be sure your plant is snug and secure in it's new pot, pick it up by the leaves and the pot should stay on. Step 7) Don't water until the plant goes almost dry. It's tempting to water the orchid right away, but don't! Wait until the plant is almost dry before watering normally. Letting the plant dry out a bit encourages it to start growing new roots to search for water. fred, kine671, snazzyboots and 4 others like this. Last edited by Vian; 12-21-2012 at 06:20 PM. Interesting, thanks for taking the time to do it, hope some of the new growers learn something from it! WOW!!! Quite in depth! I've read repotting in books before but you really took some time to think and cover the bases!!! Wonderful! Thank you for doing that! This post gave me a lot of confidence to repot one of my 'chids. I'm still fairly new to them (as well as this board), so thanks for the in depth post. Very useful tips for newbie like me. Thank You! Nicely done and documented, Vian! I am a little more confident when I get ready to re-pot her. (Still doing some studying and note taking before I make any big moves. )My new Baby is still acclimating herself to my house, so I will give her the time she needs.